We are excited to launch a new and exciting registration program for the 2019 ACM Camp! This short tutorial will introduce the basics and help get you into the system. From there it's very self-explanatory. I have included a few, but not all, screen shots to get you started. You will also need a digital photo of all campers to upload as well as their medical history, medical insurance information and form of payment. 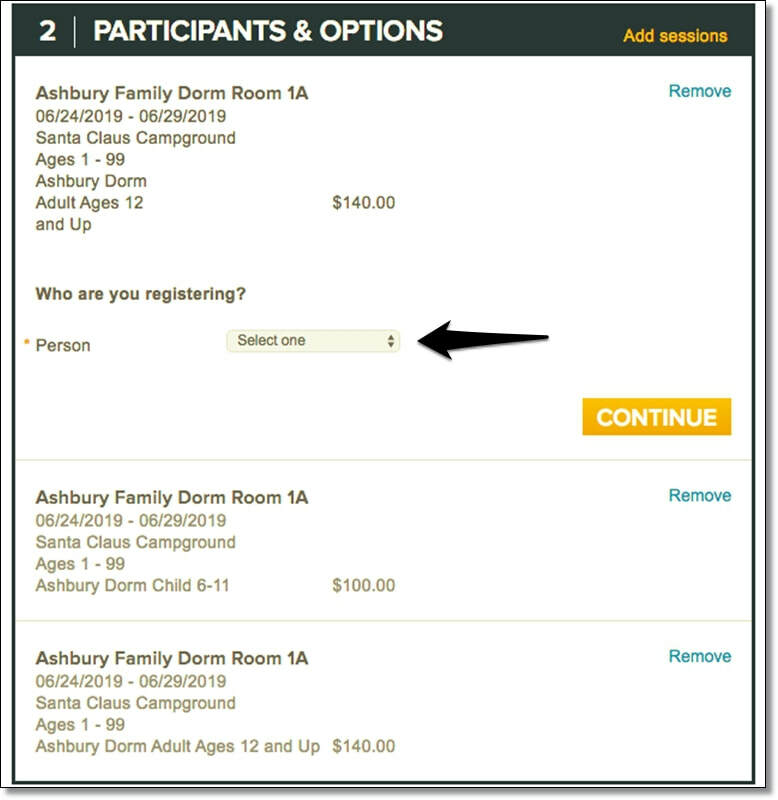 When you log onto the “Active” registration site, via the link provided here, on the ACMin.Weebly.com site, you will see the screen below. 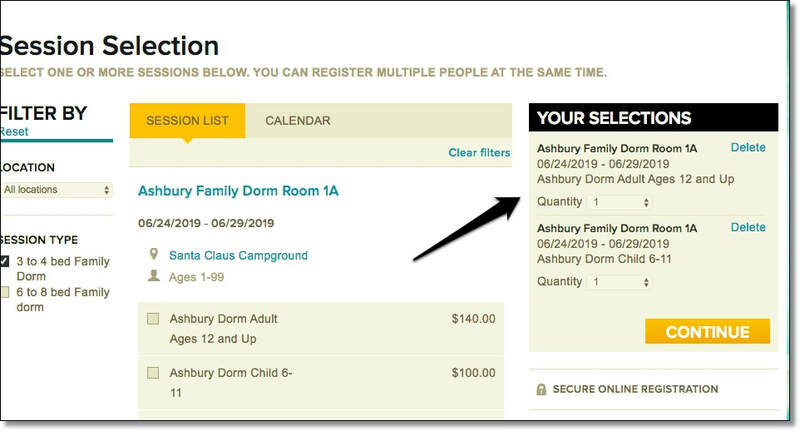 This year you can select which family dorm you prefer along with room preference (please review the family dorm room layouts and occupancy rules on the registration page). 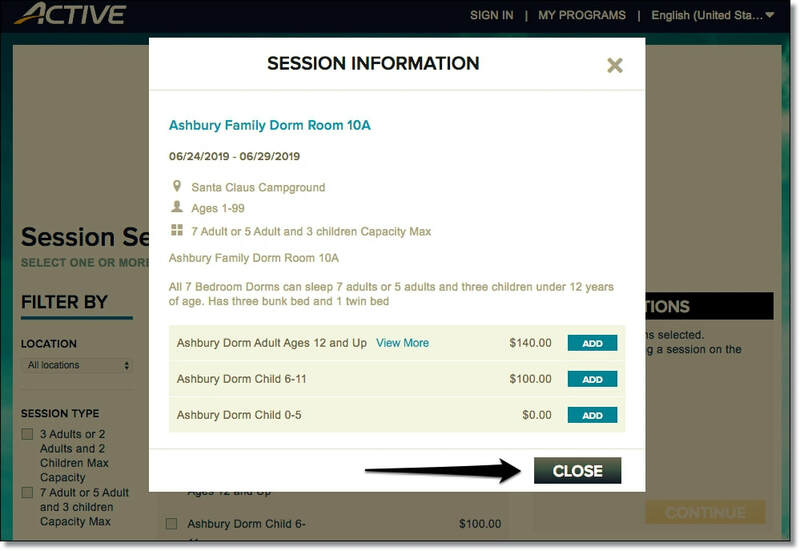 If your children are staying in the boys or girls’ dorms you can select upper or lower bunks, based on availability. 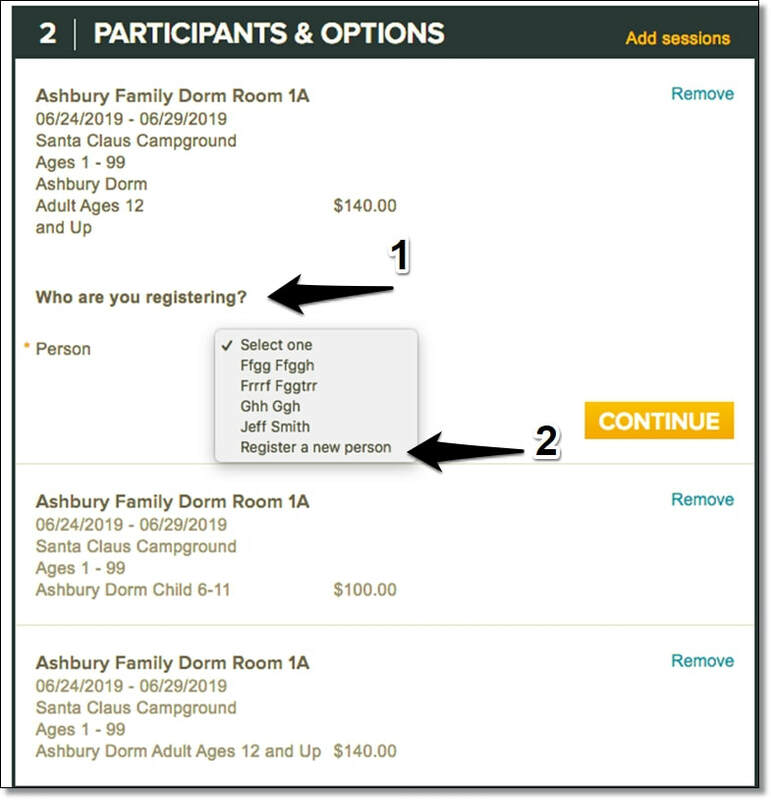 We are going to select the Ashbury dorm for this demo by selecting the “view” button to the right. In Ashbury, there are three bed dorms and seven bed dorms. These rooms have minimum and maximum person requirements that must be met or the registration may be rejected by the Registration coordinator Please pay close attention to the requirements listed. On this page, select which session type you prefer, three or seven bedrooms (arrow 1), and the system will show you all available rooms that match that criteria. Closing out of the above screen will take you to the previous screen. ​​• In the screenshot below, you'll see we added one adult, age 12 and up, and one child, age 6-11. 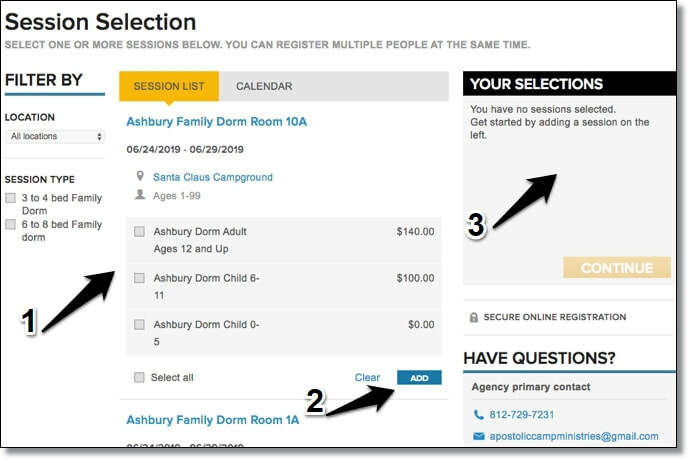 If there were two adults and two children, you then change the quantity of registrants that meet that age requirement, in the "Quantity" box, under the "Your Selections" tab (see arrow). • When finished, use the "Continue” button to be taken to the “Registration Information” page. • If you are registering a family, start with the primary registrant first. 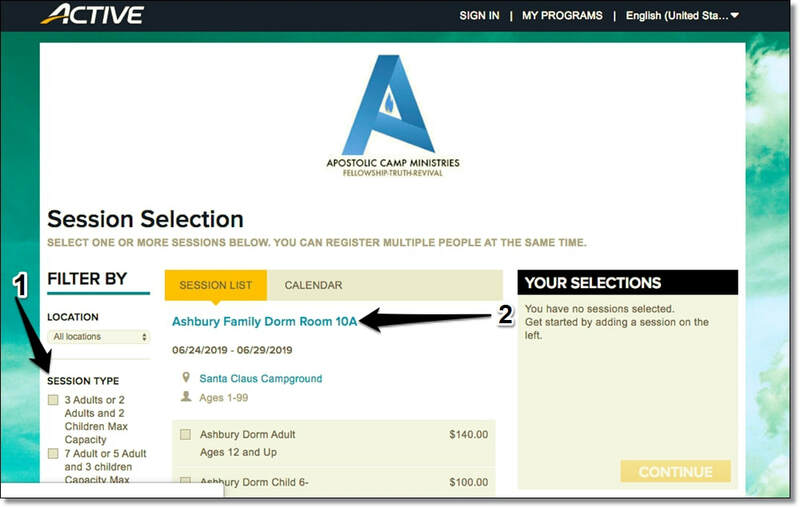 • You'll see the drop-down box indicating, “Who are you registering” (arrow 1). ​• Select “Register a new person” (arrow 2). ​• Then, advance the process and go through each registrant’s forms filling out each one’s personal information. • Once completed, you will be taken to a payment screen where you can then choose payment type, payment plan and complete your process. 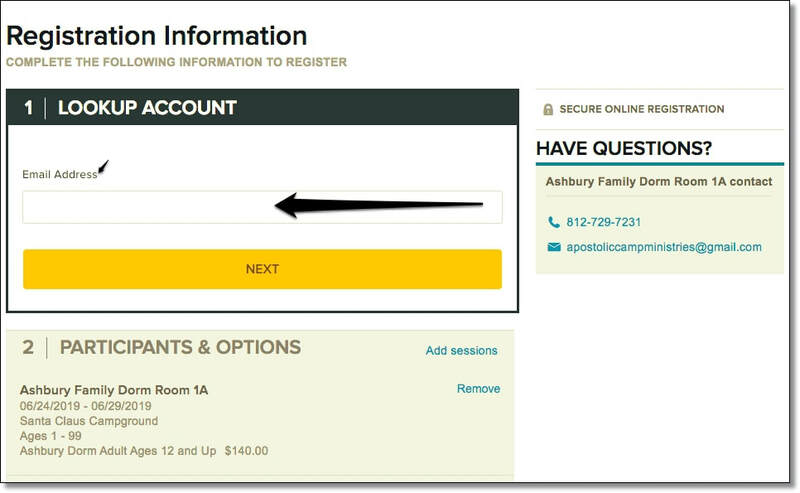 Once registration is complete, you can log in at any time to pay off any remaining balance regardless of initial payment plan selected. • At the end, you will have established an account that will allow you access to your information any time. Within the account, you'll also be able to purchase any camp-related merchandise that may be available for sale. Please save your account access information as ACM staff will not have access to it. There is also a waiver document that must signed, photos that are required to be uploaded and a confirmation e-mail responded to, that will contain important documents. We do not recommend taking out Active Registration's cancellation insurance, since ACM will work independently with anyone who cancels for a legitimate reason..
Once registration is completed, you can return to “your account” at any time from the link provided here, on the ACMin.Weebly.com site, to add, edit or upload any pertinent information or make additional payments. Any registration questions can be submitted through the ACMin.Weebly.com contact form and they will be answered within 24 hours.